If your PC is starting to feel a bit slow and long in the tooth, you might want to consider upgrading your storage banks to one today’s best gaming SSDs. Simply put, you need an SSD – even if it’s only for installing Windows on, or your other OS of choice. Not only will your PC load in the blink of an eye (okay, maybe a couple of blinks), but it will also help you get to your games much faster, cutting down load times and the number of minutes spent waiting to jump into your favourite virtual paradises. Tried and tested here at the RPS Treehouse, we’ve got a best gaming SSD recommendation for everyone here, from your entry-level 2.5in SATA drives right up to your fancy, super expensive M.2 NVMe SSDs. You’ll also find everything you need to know about buying the best gaming SSD in our in-depth buying guide, giving you detailed information on all the different types and form factors, as well as what size you should think about getting. Whether it’s for gaming, installing Windows or the fastest speeds money can buy, here are the best gaming SSDs available right now. Buying an SSD can be tricky. On the box, the main figure you’re often bombarded with is an SSD’s sequential read and write speeds, which can often be in the hundreds or thousands of MB/s. This all sounds very fast, but in practice it’s not actually a very good indicator at all of what kind of speeds you’ll get in day to day use. That’s because most SSDs read and write data randomly, sticking bits here and there all over an SSD’s storage blocks. As a result, an SSD’s random read and write speeds are really what you should be looking out for when buying a new SSD for gaming, and why I place such an important emphasis on it in my gaming SSD reviews. To test this, I use AS SSD’s synthetic 1GB 4K random test, which sees how quickly an SSD can read and write one gigabyte’s worth of tiny 4K file chunks. I also test to see how gaming SSDs cope with larger workloads as well by running them through CrystalDiskMark’s 1GB 4K 8-queue-8-thread test. Previously, Crucial’s entry-level BX300 SSD occupied this place on our best gaming SSD list, but at time of writing its MX500 sibling is a much better deal. Prices aren’t just lower for the MX500, but you’re also getting double the storage for your money, too – 250GB as opposed to 120GB on the £43 / $30 BX300. Admittedly, the situation appears to be worse in the UK than across the pond, but when a 240GB BX300 will set you back an extortionate $70 in the US, the MX500 still comes out as the better value SSD. In terms of performance, the MX500 is second only to Samsung’s more expensive 860 Evo, which you’ll find further down on this list. Its random read and write speeds are some of the best around, and much faster than its other main rival, the WD Blue 3D NAND. The MX500 also comes with a generous five year warranty, too, giving you peace of mind in case something happens to go wrong. 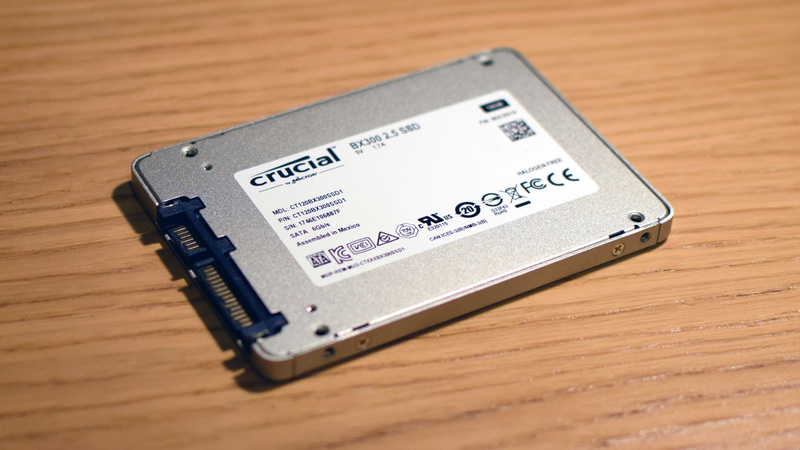 Of course, if you’re looking to keep costs to an absolute minimum, you may well be tempted by Crucial’s other entry-level SSD, the BX500. After all, this costs just £28 / $39 for 240GB at time of writing, making it much cheaper than the MX500. However, the BX500’s random read and write speeds simply don’t compare with the MX500, so I’d strongly recommended finding room in your budget for another £10 / $20 if you can. You won’t regret it. Read our Crucial MX500 review for more info. Despite not being that much faster than its predecessor, the Samsung 850 Evo, the 860 Evo remains one of the best gaming SSDs around. Its random read speeds are faster than any other 2.5in SATA3 SSD I’ve tested so far, and its warranty and endurance rating are also top of their respective classes. The only SSD I’ve tested with a faster random write speed is Samsung’s 860 Qvo, but the smallest size available on that one is 1TB, thereby making it considerably more expensive as a result. That said, the 860 Qvo really comes into its own at higher capacities, as the way it’s been built is all about getting as much storage as possible for the least amount of money. Indeed, it’s far cheaper than the 860 Evo once you start pushing into the 1TB and 2TB categories (and arguably makes more sense than buying a smaller SSD to have as your primary drive and a larger but infinitely slower hard disk drive for storing games on), so I’d recommend opting for the Qvo instead of the Evo if you’re after something larger than 500GB. For those looking to keep SSD costs to under £100 / $100, however, the 500GB Samsung 860 Evo is definitely the way to go. Not only is it faster than Crucial’s MX500, particularly when it comes to random write speeds, but it also comes with a much higher endurance rating: 300 terabytes written (TBW) for the 500GB model as opposed to just 180TBW on the 500GB MX500. It’s fast, durable and I’ve yet to see another 500GB SSD beat it when it comes to overall value. That said, if you’ve got a fraction more to spend and have a motherboard that supports NVMe SSDs (which require an M.2 slot), then I’d also recommended the equally excellent 512GB Adata XPG SX8200 Pro. This has exceptional random read speeds and only mildly slower random write speeds than its more expensive competition, such as the Samsung 970 Evo below. All in all, it’s a fantastic drive, and a great alternative to the 860 Evo depending on how much money you’ve got to spend. Read our Samsung 860 Evo review for more info. Yes, it’s another Samsung. If you really want the best of the best SSDs that money can buy and would rather mount it straight onto your motherboard than faff around with SATA cables, the Samsung 970 Evo is the ultimate gaming SSD for tidy people with lots of money to spend. Technically, Samsung’s more upmarket 970 Pro is the superior drive in this category, but you’ll hate yourself a lot less by opting for the significantly cheaper and still blisteringly fast Evo model. Since this is only available in an M.2 form factor, you’ll need to make sure your motherboard supports it before you buy one. Most modern motherboards do, though, so provided you’ve got a spare M.2 slot ready and waiting, the 970 Evo is undoubtedly the best and most affordable way to get a taste of what NVMe SSDs have to offer. Available in 250GB, 500GB, 1TB and 2TB size capacities, the 970 Evo is a big step up from your typical 2.5in SATA3 SSD. Capable of handling heavy read and write queues in over 1400MB/s, this is an SSD for the ultimate power user. You don’t quite get those sorts of speeds for smaller, everyday tasks, mind, but you’re still looking at significantly faster read and write speeds (28% and 42% respectively) than Samsung’s 860 Evo. Speed-wise, the 970 Evo also comfortably sees off the competition from WD Black 3D NVMe SSD, WD Black SN750, Adata XPG SX6000 Pro, but the Adata XPG SX8200 Pro (mentioned above) still comes out on top for random read speeds. I should also mention you can get a 1TB SX8200 Pro for under £200 / $200, whereas a 1TB 970 Evo will set you back another £50 / $50, so if you’re after a lot of storage for less and don’t mind having slightly slower random write speeds, the SX8200 Pro is also excellent value. Read our Samsung 970 Evo review for more info. Did someone say Samsung again? 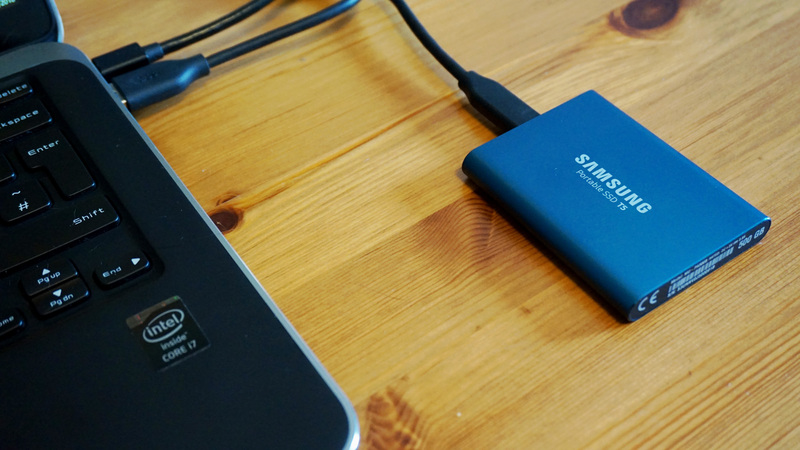 I know, I know, I’m starting to sound like a broken record here, but honestly the Samsung T5 is the best external SSD I’ve tested so far. Granted, I’ve only looked at the WD My Passport SSD as a point of comparison so far (something I’m going to rectify in 2019), but of the two, the T5 is definitely the one I’d go for. It’s not only cheaper than the WD My Passport, but it’s also much faster and an infinitely nicer looking thing to boot. It’s expensive, yes, especially compared to your typical 2.5in SATA3 drive, but if you’re the type of person who travels a lot and doesn’t have enough room for all your games on your laptop, the T5 is a worthwhile investment. For starters, it’s absolutely tiny and will easily slot into any kind of pocket. What’s more, the fact it’s an SSD means it’s also far less likely to break than an external hard disk drive. The T5 also comes with both USB3 and USB-C connectors for super fast transfer speeds, and its random read and write speeds are pretty good too. It’s nowhere near as nippy as Samsung’s 860 Evo, but in terms of overall convenience, nothing else comes close. Read our Samsung T5 review for more info. 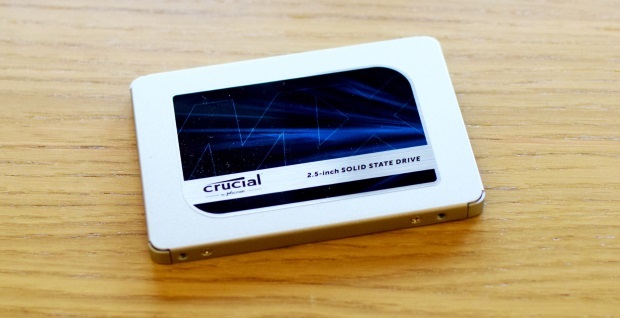 2.5in SSDs: The easiest drop-in replacement for a standard hard disk is a 2.5in SATA model. These are the same size and shape as a standard 2.5in hard disk, and plug into a normal SATA port on your motherboard. Most modern PC cases have mounting points for 2.5in hard disks, often on the back of the motherboard tray. If yours doesn’t, you can use a £5 adaptor (really just a 3.5in-wide metal plate with screw holes) to fit the SSD in a normal 3.5in hard disk bay. To avoid crippling the SSD’s performance, make sure you plug the SSD into a SATA 3 port on your motherboard, rather than use SATA 2. SATA 3 SSDs will work in SATA 2 ports, but you’ll likely lose around half the SSD’s performance. The chief disadvantage of 2.5in SSDs, compared to the mSATA, M.2 and PCI Express cards discussed below, is that they use SATA 3: an interface that’s been around since 2009, and one that isn’t quick enough to cope with the fastest modern SSDs. However, for most users, a SATA 3 SSD will be fine, and still several times faster than a mechanical hard disk. M.2 and PCIe SSDs: If you’re in the market for a super-fast SSD that won’t be encumbered by its interface, you need to move beyond SATA to PCI Express, or PCIe (also called PCIe NVMe or just NVMe). Most PCIe SSDs are mounted directly to the motherboard in an M.2 slot. If your motherboard doesn’t have such a slot, there’s only one way to unleash the speed: a PCIe add-in card (AIC). These add-in cards will fit in a spare PCIe x4 or x16 slot and are monstrously quick, as well as monstrously expensive. If you have a newer motherboard with an M.2 slot, an M.2 SSD is a neater way to add super-fast PCIe storage. Most M.2 SSDs are just 22mm wide and 80mm long (so about a third shorter than a stick of RAM) and screw straight into the motherboard – no more having to route SATA and power cables around your case. However, the M.2 standard is a little complicated, chiefly due to its versatility. For starters, there are several sizes of M.2 card, such as 2280 and 22110: the first two digits denote the card’s width in mm, and the remaining numbers are the card’s length. Fortunately, the majority of consumer M.2 SSDs are the 2280 size. What’s more, as well as PCIe storage, the M.2 slot can also support SATA SSDs. These don’t have the performance advantage of PCIe M.2 drives, but score for neatness, and are about the same price as 2.5in SSDs. Check what standards your motherboard supports, as PCIe SSDs will not work in SATA-only slots and vice versa. The good news is that many motherboards support both PCIe and SATA M.2 SSDs, giving you the versatility to choose between fast-but-expensive PCIe and slower (but still fast) and cheaper SATA. Bear in mind that the claimed speeds are for sequential transfers, rather than random reads and writes, so should be considered a best-case scenario. It’s also worth looking at a drive’s IOPS, or input/output operations per second, rating. This isn’t always listed in an SSD’s specifications, but it can make a big difference to an SSD’s real-world performance. A drive with a high IOPS rating can perform many more data reads and writes per second than a lower-rated model, which can make a huge difference in the complex data transfer tasks required by a modern operating system. One of the first things you’ll notice when shopping for an SSD is that they’re an awful lot more expensive than mechanical hard disks. Spinning disks are astounding value, with 1TB models available for £40; if you want a terabyte SSD, you’ll have to find over £250. For this reason, if you’re on any kind of budget, you’ll need to think about how much capacity you need. The minimum size SSD I’d recommend is 250GB, as this will give you room for Windows, your productivity applications and a few games. If you have a large photo and music collection that takes up around 100GB, say, it’s probably worth bumping it up to the 500GB mark. With Windows (around 20GB), Office (around 3GB), five or so big games and all my pictures and tunes, you’ll still have about 80GB left on such an SSD – and games are only going to get bigger, too. If you like to have more than a couple of big titles installed at once without compromising on load times, you may want to consider finding the cash for a 1TB SSD. Some high-performance SSDs are quicker at larger capacities as well, due to having more flash chips for the SSD controller to access in parallel. If you need more space, it may be worth using your SSD alongside a normal hard disk, or even the hard disk you currently own. You can use the SSD for Windows, applications and games, and put your space-hungry files on the hard disk. By default the Windows Users folders, so Documents, Pictures, Videos and so on, will be on the system (C) drive, but you can redirect them to another disk by right-clicking each folder, selecting Properties, then Location. However, redirecting your Users folders away from their default locations can sometimes cause problems; if I was going to use the SSD/hard disk combo, I’d just create standard folders for the big files I wanted to keep on the hard disk, and avoid the corresponding Users folders entirely.